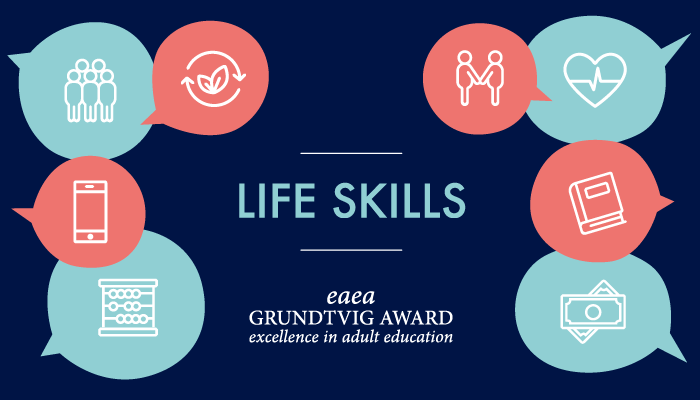 With the EAEA Grundtvig Award 2019 EAEA aims to raise awareness, at a European level, for the importance of promoting life skills in adult education. Life skills are a set of different capabilities that make adults able to cope with problems of their independent life as individuals and participate in a collective life within society. Life skills contribute to social and civic engagement, self-efficacy and employability, but also to key challenges that adults have to face in the modern world, such as taking care of their physical and mental health, actively contributing to their wellbeing, mastering financial matters and coping with the digital environment. The Grundtvig Award is given to organisations or project consortiums who present the best transnational projects in adult learning, promoting new ideas, new partnerships, new methodologies and a new understanding of how we can work in adult learning.